These aerial videos of Namib-Naukluft in Namibia, the Arches National Park in Utah, the Serengeti in Tanzania and the Emerald lake in the Canadian Rockies will lift your spirit and leave you in awe of our beautiful planet. It wasn’t easy picking 4 of the best drone videos of National Parks and Wildlife. I’ve watched dozens of videos and found 4 of best drone videos of parks and wildlife by professional drone cinematographers I’ve ever seen. They have produced the below scenic masterpieces of Mother Nature. Aerial cinematography at its very best. This drone video shines a bright light on the beautiful and contrasting landscapes of Namibia. Most of us will never visit Namibia which is down the South West of the African Continent. There are 2 really special spots captured in this video. Spitzkoppe which is in the Namib desert is just stunning. It has these 700 million year old peaks which stand out dramatically from the flat surrounding plains. Then there is the Sossusvlei which is a salt and clay pan surrounded by high red dunes. 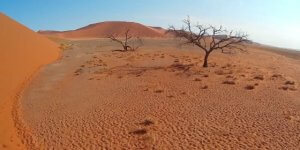 Soussuslei is located in the southern part of the Namib Desert, in the Naukluft National Park. Just stunning. Great drone piloting and camera skills. The Arches National Park lies in the state of Utah, USA. It is bordered by the Colorado River in the southeast. The Arches National Park features some of the most unique geography and color tones of any place you’ll visit . This quadcopter video is professionally filmed and is stunning. Even then, the film maker says, “The video doesn’t come close to being right there, to capture the richness of the desert, the crisp fragrance of the air and breathing it all in”. This quadcopter video comes close though. Enjoy and if you get a chance, head on down to the Arches National Park in eastern Utah. This drone video was captured using a DJI Phantom 2 with a GoPro HERO3+. Now, this video is beautiful. Now, with the latest top drones which all have 4k UHD cameras and even better stabilization, then the below video would have five times better quality. The Serengeti in Tanzania is filmed in all its magnificence by Will Burrard Lucas. He uses his own home made drone called a Beetlecopter. The camera used is a GoPro which captures drone video perfectly. Drones are perfect for Wildlife filming. They are easy to maneuver and you can get in real close to the wildlife with minimal disturbance. This really is a beautiful drone video. The Serengeti’s open plains and the roundness of the earth reaches your heart. This video features incredible images of getting up close to a hyena, eye to eye with a giraffe, elephants from above, a beautiful stream full of hippopotamus and the running of the white bearded wildebeest. Words cannot describe this natural wonder. The Emerald lake and the surrounding Yoho National Park is UNESCO listed so it is pretty special. I will leave you to enjoy this perfectly filmed drone video and be reminded how beautiful our planet is.